In various music theory exams (typically grades 1 through 4) you will be asked to add bar lines to a given melody. This is a useful exercise as it forces you to look at the rhythm carefully. It’s an important step in understanding any music that’s in front of you. So how do we add bar lines to music? To add bar lines, count the note values (aka. time values) and organize them into bars according to the given time signature. When counting a rhythm always double check the details such as any dotted notes, rests, tied notes and triplets. As we’ve discussed in this article about time signatures, rhythm is an indispensable part of music so it’s important to get this right! In this lesson we’re going to break it down into steps. The lesson covers the typical syllabi as offered by these music boards: ABRSM, Trinity and University of West London. Exercises are at the end so you can also practice on your time. Look at the top number of the time signature. This number tells us how many beats every bar must get. Look at the lower number of the time signature. This number tells us what kind of beats we have. Count the note values of the melody and group them according to the time signature. As you know, some notes are exactly one beat long but many others are longer or shorter. Watch out especially for dotted notes (and in grade 4, watch out also for double dotted notes). You might also encounter some rests. Remember that these are equivalent to note values and count just the same. Tied notes don’t change the values of notes. They simply join 2 (or more) notes together. As we’ll see they can be good hints at what the time signature actually is. 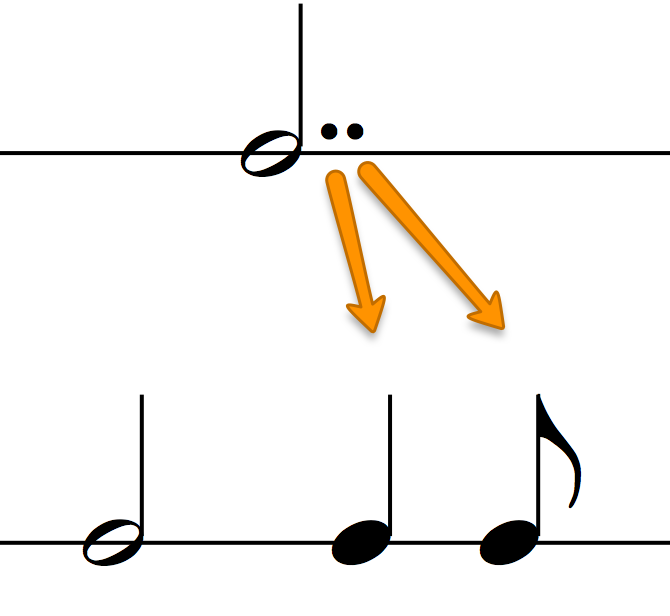 The basic note values with a dot as well as ties. Let’s say we are given this melody. The given time signature is 4/4 and only the first bar line is written. We need to add the remaining bar lines. Step 1: The top number of the time signature is 4. That means we’re dealing with 4 beats in every bar. Step 2: The bottom number of the time signature is also 4. That means that the beats are crotchets (in US terms, quarter notes). We get to this answer by dividing the semibreve (the whole note) by that bottom number: 4. Step 3: Now that we know that every bar must have 4 quarter crotchet beats, count the note values. Every 4 crotchet beats must be grouped into a bar. Notice that I didn’t say “Every 4 notes must be grouped into a bar” but “Every 4 quarter note beats”. Remember that one note can take up any amount of beats: from half a beat (or less), to 4 beats (or more). This is why it’s so important to consider the value of the beat. This example is fairly simple so we don’t need those other steps. Here’s the answer. This next example is in 2/4. Just for an extra bit of challenge, no bar lines at all are given. The steps to add bar lines are exactly the same as before. Steps 1 and 2 are about figuring out the time signature – in this case, it’s 2/4 and that means 2 crotchet beats in every bar. What we do now is simply count the notes and every 2 crotchet beats, we draw a bar line. From music theory, you know that a quaver (an eighth note) is half a crotchet. And that means that 2 quavers make a full crotchet. The way that quavers (eighth notes) and smaller note values are joined by a beam into groups is a good hint at what the time signature is. >> The first note of a group of beamed notes is always on a stronger beat. Now here’s an example with several dotted notes as well as a rest. A dot adds half the value to the original. So a dotted crotchet is worth 3 quavers (2 from the original plus 1 from the dot); and a dotted minim is worth 3 crotchets (2 from the original plus 1 from the dot). Rests are counted just as notes are. In this case we have a crotchet rest so (just like a crotchet note) it’s exactly one beat long. So the answer to this example is as follows. The working out is on top in orange. Once again, notice how the grouping of the eighth notes follows the layout of the time signature. The first set of eighth notes (bar 1) covers the third and fourth beats. The second set of eight notes (bar 4) covers the first and second beats. In these exercises you will never be asked to draw a bar line across a beam! This next example features some semiquavers (sixteenth notes) as well as dotted quavers (dotted eighth notes). Nothing else is new so we’ll go through the same process to add bar lines. The time signature is 3/4 meaning 3 crotchet beats in every bar. We have quite a few dotted quavers + semiquaver units (that’s dotted eighth + sixteenth in the US). Since the dotted quaver is equal to 3 semiquavers, the unit consists of 4 semiquavers. As you know from music theory, that equals a crotchet. In fact, when we count every note, we’ll realize that every group equals a crotchet. And in this time signature, that’s a beat. The only note that takes more than a beat is that minim (half note). This next example is not much different than all the others except for the ties. Or because a long note doesn’t fit so it needs to take some time value from the next bar. This second point is useful: ties can (and often do) cross a bar line. So with these points in mind, we simply add all the notes and put a bar line every 3 crotchet beats (as the time signature is 3/4). Triplets (including triplets with rests). Let’s dive right into some examples. As you can see, the time signature here is 3/8. The top number is 3 and that means 3 beats in every bar. The bottom number is 8 and that means that the beats are quavers (eighth notes). Just like before we get to this answer by dividing the semibreve (whole note) by that bottom number. So the time signature 3/8 tells us that we have 3 quaver beats in every bar. It shouldn’t be too difficult to add bar lines here. All we have to do is count the value of the notes and add a bar line every 3 quavers. Like before, the beaming and the grouping of quavers and smaller notes is extremely helpful. In 3/8, these rhythms shown here are very common. Observe how most are grouped in 3 quaver beats (and so that means a whole bar). Of course we can have rests as well. They don’t change anything in our counting of quaver beats. All these units below are also 3 quaver beats long and take exactly one bar in 3/8. As we’ve seen a few moments ago, in grade 2 you will also deal with time signatures whose bottom number is 2. In these time signatures the beat is measured in minims (half notes). So in this example, we get 2 minim beats in every bar. Such a question could just as easily include a few rests here and there. This doesn’t change anything in the way we count. Triplets are another addition to the syllabus in grade 2. 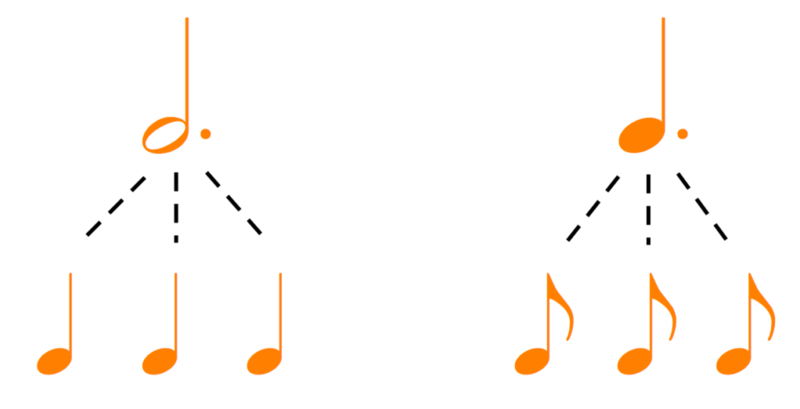 A triplet is the division of a beat (or part of a beat) into 3 notes instead of the normal 2. Triplets are marked with a small 3. So for example, a quaver triplet consists of 3 quavers in the place of 2 (quavers). Since the quaver triplet takes up the space of 2 quavers, it obviously counts as 2 quavers (or 1 crotchet). There is no particular reason that the second beat is the triplet in the example above. It’s just my choice for an example. It could have been on the first beat and it could have been on both beats. In other words, triplets can go anywhere. Here’s another triplet example. This one is a minim triplet. It’s 3 minims in the space of 2. So these 2 bars below have the same amount of beats: 2 minim beats. The only difference is that the first beat of the 2nd example is filled with a crotchet triplet. So here’s an example with triplets. The time signature is 3/2 meaning 3 minim beats in every bar. Where should we add the bar lines? Now considering that the crotchet triplet takes up the time of 2 crotchets, then it’s equivalent to a minim. Since the time signature is 2/2, a minim is exactly one beat. And so the crotchet triplet in this time signature also takes up exactly one beat. This next example features many quaver triplets. As we just discussed, the triplet takes the time of 2 of the same kind. So in this case, the quaver triplet takes the time of 2 quavers. Considering that the time signature is 3/4, every bar will consist of three crotchet beats. The 32nd note (demisemiquaver) and its equivalent rest. Let’s dive right in with some examples. If you were able to follow what we’ve done so far today in grades 1 and 2, grade 3 is just a step forward. Like 3/8, the time signatures 6/8, 9/8 and 12/8 are measured in quaver beats (eighth note beats). The big difference however, is that 3/8 is a ‘simple time signature’ while 6/8, 9/8, and 12/8 are ‘compound time signatures’. Compound time signatures are those whose beats divide naturally into 3 parts rather than 2. This happens because the beats of compound time signatures are dotted. In the particular time signatures for this grade, the beat is a dotted crotchet (a dotted quarter note). What this means for us when we have to add bar lines is that we’re looking for these units that combine into a dotted crotchet (just like we did with the exercise in 3/8). Here’s an example in 9/8. Where should we add the bar lines? Although 9/8 means 9 quavers in a bar, it’s not actually 9 beats. As we discussed, the quavers in compound time signatures group into threes. That means that we actually have 3 beats (9 division by 3). Specifically, we have 3 dotted crotchet beats and each one of them contains 3 quavers. Note that a dotted crotchet rest is equal to a dotted crotchet note and so in these compound time signatures, it takes up an entire beat. In grade 3 you might also encounter the demisemiquaver note (the 32nd note) and its equivalent rest. As its name implies, the demisemiquaver is worth exactly half a semiquaver. So two demisemiquavers make a semiquaver. (In American terminology that’s two 32nd notes make one 16th note). Where should we add bar lines in this exercise? Once again, the beaming provides good hints. Since the time signature is 6/8, we must put a bar line after every 2 dotted crotchet beats (2 dotted quarters). Remember that although 6/8 means 6 quaver beats in every bar, we’re actually counting 2 beats of 3 quavers each – that is, 2 dotted crotchet beats. There could have been rests too but as we’ve seen over and over again, they don’t change anything in how we count these rhythms and add bar lines. Before we get into our final example for this lesson, let’s quickly review these new topics. The breve (and its equivalent rest) is twice as long as the semibreve. In American terminology it’s known as a double whole note. The first dot is worth half the original value. The second dot is worth half the first dot. Add these all together and you get the value of the double dotted note. Here’s an example with the double dotted crotchet. The first dot is half the original (half a crotchet) so it’s worth a quaver. The second dot is worth half that quaver, so it’s a semiquaver. Here’s an example with the double dotted minim. The first dot is half the original (half a minim) so it’s worth a crotchet. The second dot is worth half of that crotchet so it’s a quaver. The time signature of this example is in 4/2 meaning that every bar will have 4 minim beats. Notice also the breve and semibreve rests. I hope this lesson helped you understand how to count rhythms and time signatures. Download the exercises below for more practice. And if you have any questions, leave a comment below or let me know on our Facebook group here.